Our free weekly email for home health coders is filled with home health coding tips and a chance to win a $10 Starbucks e-card. We include a link to the regular Monday morning giveaway on our Facebook page, which we call the Code & Coffee Quiz. 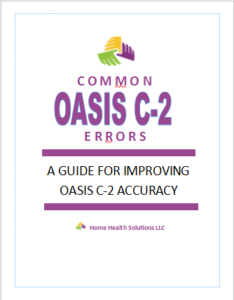 The Quiz poses a one question home health coding challenge. One person who comments is randomly selected to win each week’s Starbucks e-card. It’s that simple. Come join us! Sign up in the box below. 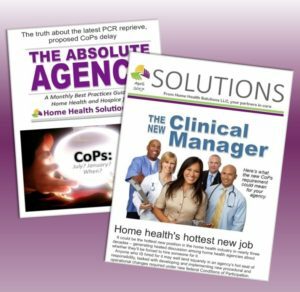 SOLUTIONS is a free monthly e-newsletter spotlighting the products and services HHS offers. Click here to sign up for it! Right now you’ll receive a free copy of “Think Like An Auditor” when you sign up for SOLUTIONS. THE ABSOLUTE AGENCY is our new free best practices guide with news of interest to agency managers and administrators. Click here to sign up for it!